Lapsang Souchong is a subtly perfumed black tea. 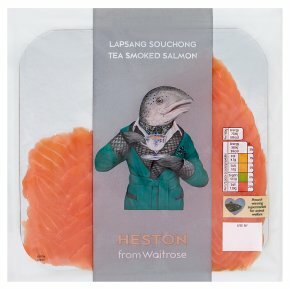 Because the leaves are traditionally smoked over pinewood fires it has a distinctive smoky taste which imparts a lovely flavour to the responsibly farmed Scottish salmon. It will pair wonderfully with a gently peaty single malt whisky if you're lucky enough to have some handy.